It's important to learn the basics of color design before playing with colors while decorating. It's easy to do too much or too little, and many people shy away from bright or strong shades entirely. The most striking and beautiful rooms are often full of strategically placed color - learn the best ways to introduce some into your home. The color wheel is an important piece of basic of color design. It is literally a wheel with twelve colors on it made up of primary, secondary and tertiary colors. Use primary colors to create simple but effective designs in the home. Primary colors have been used, along with black and white, in pop art and modern design for the last 60 years. Create an unusual setting by painting built-in cabinetry or woodwork in primary hues, with white walls. 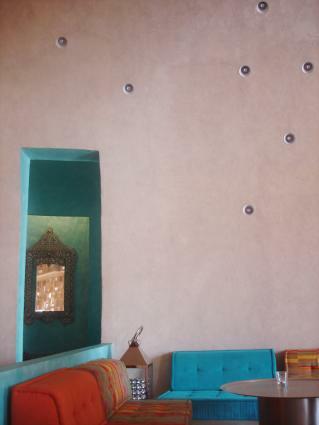 Or create an accent wall of a bold, clear primary color such as red. Don't be afraid to tone down or punch up the shades of primary colors until you get the hue that works best with your home. Secondary colors allow you to branch out more in color design. Where red might be too bold, orange might be a better fit. Most secondary colors have a wide range of variation, owing to the amounts of primary color that are included in their base. For example, you can have a green that is closer to yellow or a green that is closer to red. For a more subtle approach to color, with less dramatic results than primary colors, introduce secondary colors as wall, ceiling and fabric color choices. Tertiary colors are the perfect way to tie together a color scheme in a room. For example, create an ocean palette of pale blue walls and green drapes. Use the tertiary color blue-green in accents such as lamps, throw pillows and in the walls art. Tertiary colors help cement the color design within one space and can help you transition from one area of color to another. The place where the colors are on the wheel and where they are in relation to the other colors can tell us a great deal. It can tell us which colors will work well together. Complementary colors are the colors opposite each other on the color wheel. These colors often work well together. Use complementary colors for bold design choices in your home. For example, paint the walls of a room blue and use orange accents such as throw pillows or wall art. Because blue and orange are opposite one another, they will complement and highlight each other without competing for your eye. These are colors next to each other on the color wheel. These colors also work well together but do not offer the contrast of complimentary colors. Consider using analogous colors for a more subtle palette. For example, use yellow, green and yellow-green together in one room. Select one color for the main walls, a second for an accent wall and the third to be placed in draperies, rugs and furniture. Alternatively, keep the wall color neutral and combine analogous colors into the furniture and accents for a subtle breath of color in the room. Decorating with a triad means that you use three colors off the color wheel that form a triangle. This method can be difficult, but it creates a very balanced color look. Triad colors can be as simple as including shades of red, blue and yellow - the primary colors - in one room. Use one color, such as yellow, on the walls for the room's main color. Use red furniture in the same palette as the yellow, and include throw pillows, rugs and window treatments that include both red and yellow with pops of blue to enliven the design. Neutrals make a great background for accent colors, and give the eye a place to rest. Even if you love color, don't shy away from some well placed neutrals to anchor your design. Crisp white trim against a saturated wall can help bring the room into focus, while a rich brown or a stormy gray will make other colors pop against them. Temperature is a relative color term that relates to the warmth or coolness of a color. Blues and greens are generally cool, while reds and yellows are generally warm. Select cool colors for the walls and ceilings of small rooms. Cool colors recede from the eye when viewed, so painting walls blue or the ceiling a dusky purple can actually help open the room. Use warm colors to create cozy feeling spaces and conversation areas. Use warm colors on accent walls or in long, narrow rooms to shorten the space and bring it into proportion. Remember that many people specific colors that they love and hate. Some may see blue as a depressing color, while others think of the ocean. With green, some might see it as an envious, jealous color, while it reminds others of the natural world. Take your personal feelings into account, but look at the room itself as well. You may want a bright, cheerful yellow kitchen, but if your kitchen is already strongly lit with sun and/or fluorescents, painting the walls yellow might be a little overwhelming. Tone down to a cream or light tan instead and inject your yellow into prints, dish towels and kitchen backsplash tile. There are several ways to go about selecting the colors for your home. Your favorite colors make a great starting point to jump off of. Pick one color that you feel works well in the space and try pairing it with its complementary color, or an analogous color to see the effect. Pay attention to what the space is telling you as well; tone up or down the color or temperature to enhance the size of the room. Wall art can be a wonderful jumping off point for color design in a space as well. Use a favorite print, tapestry or photograph and pull colors from within it for the walls, floor, ceiling and fabrics. With one piece of art tying the colors together, this can create a harmonious effect in the room. Start slowly when designing with color for the first time. Use paint samples and fabric swatches, and live with them for several days to see the effect of light and shadow. Remember that color isn't permanent, and can frequently be changed, but getting it right the first time is always a much simpler approach.